Hiiii lovies! I have some more Brazilian holographic polishes to share :) Remember when I showed you my first two Sancion Angel polishes back in the day? Well here are two more! Yay, I was excited when these babies came in the mail! First up is Ariel, the beautiful ginger haired princess of the sea! All of these holos are named after fictional heroines, how fun is that?! This is a green tinted turquoise scattered holographic polish that is super opaque, this is one coat. Next is Arwen, named for the half-elf in Lord of the Rings, the Lady of Rivendell and Queen of the Reunited Kingdom. Yeah, I had to look that up, I really just know that Liv Tyler played her in a movie haha! 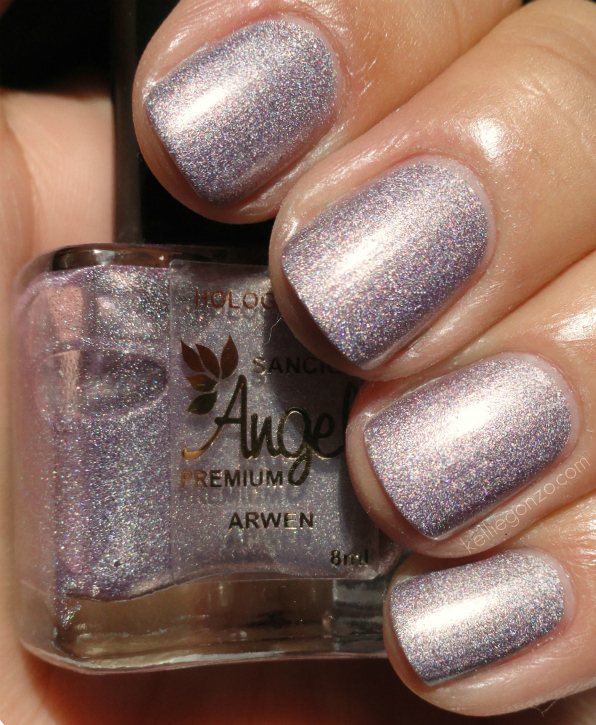 This is a light lilac scattered holographic polish. I've done two coats here. Have a good weekend my luvs!